Foreca Weather has a completely new look! Our principle was to create the simplest, fastest and most convenient weather app for frequent use globally. Give it a try and tell the world if you think that we nailed it! -	Ultra-fast and convenient rain radar on the map! Foreca provides accurate weather forecasts for any located coordinates or any search you make from millions of named locations worldwide. - Current conditions in the opening view are provided for your previous selected location. Select your current location from the compass-arrow icon. - View the latest measurements from the closest weather stations by swiping over the current conditions. - Find 10-day forecasts by dragging the opening view up. The clever daily range scale shows the trend of the lowest and highest temperatures at a glance. - Tap any day to get into the hourly view. Slide the hourly view to view more time steps. - On the map view, rain movements are directly animated on the timeline by sliding up and down over the map without having to wait or download anything – it is ultra-fast and convenient! Tap the windows icon to change between the radar and a 3-day precipitation forecast. The radar is provided only in selected areas where Foreca acquires the data, like the European and North American areas. 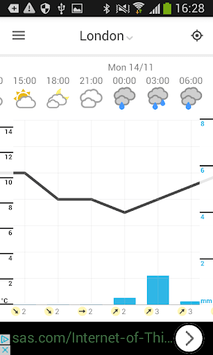 - Meteogram view shows the trend in weather at a glance. The showers (dotted bars) and continuous rain (plain blue bars) are separated in the 3-hourly forecasts. - The place search icon opens the list of your favourite places. Search for a place by name and tap the star icon to add the place into your favourites. 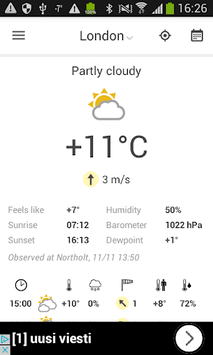 Collect your favourites such as home, workplace, and holiday resort, and see their current weather at a glance. The favourites, as well as the list of recent searches, can be used as shortcuts. 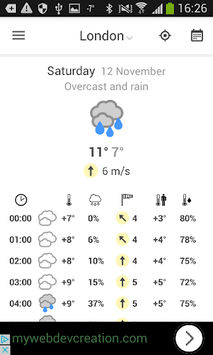 - Refresh the forecast by dragging the opening view down. When location services are used, current conditions and forecasts will be calculated on demand for your coordinates. - Choose your preferred units from the settings. - Foreca acquires weather observations and other data from multiple sources worldwide and uses thousands of hours developing machine learning techniques to provide forecasts as accurate as possible globally. The ads displayed in the app enable free use of the app for you. - Send us feedback by email from the settings view! Foreca Weather has a completely new look! Our principle was to create the simplest, fastest and most convenient weather app for frequent use globally.